Two youths were killed in ‘crossfire’. Liton (28) and Raja (27). Photo Source: Daily Amar Desh. By Bangladesh Media, Two youths were killed in ‘crossfire’ with the law enforcers in Mirpur upazila of Kushtia district in Bangladesh on early Wednesday, the police claimed. The deceased are Hossain Raja, 27, son of Intaz Ali of Kazipur village in Meherpur, and Liton Hossain, 28, son of Fulchand Hossain of Tekala village in Kushtia. In a Month this is the second incident in Kustia which took place. It could be mentioned that on October 23 of this year, another two young men were killed by the Rapid Action Battalion (RAB), in the same district of Bangladesh. After the incident police said -They were members of an inter-district gang involved in various criminal activities mainly abduction. Chokdar Abdul Halim, assistant superintendent of police (ASP) in Kushtia, said two Detective Branch police teams from Kushtia and Mirpur police stations raided Boropukuria field around 1:45am, where the gang members were holding a secret meeting. ASP Halim said, "-Sensing their presence, the criminals opened fire and also hurled two bombs targeting the law enforcers, In self defense, the police team fired back, triggering an hour-long gunfight." “We found two bodies lying on the spot after the gunfight ended,” the ASP said adding that police later identified the duo as Raja and Liton. "The remaining gang members managed to flee the scene." 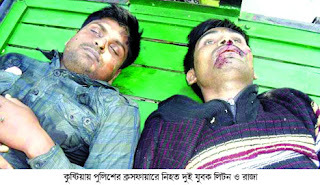 The bodies were sent to Kushtia General Hospital morgue for autopsies. It could be mentioned that the latest incidents took to 58 the number of people killed in such incidents of ‘crossfire,’ ‘gunfight’ or ‘encounter’ after January 1, 2011. Two hundred and eighty-eight people have so far fallen victim to extrajudicial killing by law enforcers since January 6, 2009 when the government assumed office with a commitment to put an end to such killings. Many disappeared with out any trace -just after the arrest by the plain cloths law enforcement agency members.